This is a very belated holiday post, but it’s a recipe that can be made year round! Last year, a Christmas Eve tradition began. As I and two of my wonderful friends are often the only folks left in Brooklyn on this Holiday, we’ve begun spending the whole weekend together. Conveniently, they happen to live next door. Last Christmas Eve, we went to the movies and spent the late part of the evening getting the royal treatment in an empty bar around the corner. The night was cozy and perfect. So, this year, I decided to make dinner for all of us but being that my one friend is a very picky eater, it proved to be a bit of a challenge. I threw out ideas that involved sweet potatoes and chili and sausage and all were shot down. She asked if I could just make a simple garlic and olive oil pasta that I had once made her and my answer was simple: I responded with a very loving “NO.” So, she and I decided to meet at the market that afternoon and figure out a meal that was at least a bit more interesting, but that would satisfy everyone’s palettes. As we browsed the isles, I started to give in to the idea of just making a simple pasta with garlic and olive oil. But I wanted some veggies in my meal, so I asked her how she felt about brussels sprouts and soon an idea for a salad began to assemble in my head. One by one, I asked her about ingredients and I was thrilled that she didn’t object to any of them. Since I was satisfied with this, I went along with request for garlic and olive oil pasta but we agreed on the additions of artichokes and pecorino. It was a delicious meal with wonderful company. I hope your Holidays were as delicious and fun as ours! Combine all ingredients, toss together and serve. 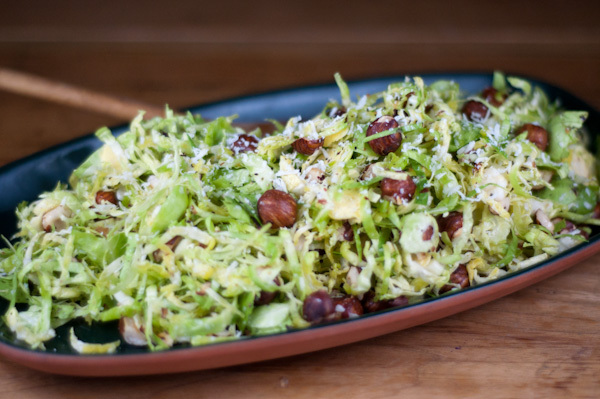 This entry was posted in Recipes and tagged brussels sprouts, extra virgin olive oil, hazelnuts, lemon, pecorino.